At the end of last year, for the first time, I visited Manastiri in Macedonia, a city that once held a beloved place in the hearts of Albanians and of Sephardic Jews. My motives were multiple. First, I had long wanted to see for myself the town that had sheltered a Sephardic Jewry known for its preservation of their Spanish linguistic medium as well as for rabbis devoted to the mystical tradition of Kabbalah. These Jewish religious figures included one I have called "the last Jewish Sufi" – Rabbi Ariel Bension (1880-1932). I had the high honor of presenting a paper on Rabbi Bension at an international scholarly conference in Sarajevo, titled "The Place and Role of Dervish Orders in Bosnia-Herzegovina – On the Occasion of the Year of Jalaluddin Rumi – 800 Years Since His Birth," sponsored by the Oriental Institute of Sarajevo, the Faculty of Islamic Studies, the Philosophical Faculty of the University of Sarajevo, and the Ibn Sina Institute of Scholarly Research, during December 13-15, 2007. In addition, in September 2007 I had the long-awaited pleasure of meeting Prof. Nissim Yosha, an Israeli expert in the Spanish-language writing of another "Balkan" Sephardic Jew, Abraham Kohen Herrera (c. 1570-1635). Architectural monument in Manastiri, photograph by Shpëtim Mahmudi. That encounter came at an academic conference in Dubrovnik dedicated to Kohen Herrera, who had been schooled in Kabbalah in the Dalmatian republic. I was delighted to learn that Nissim Yosha is a Sephardi from Manastiri – one of few survivors of that once-prosperous community. 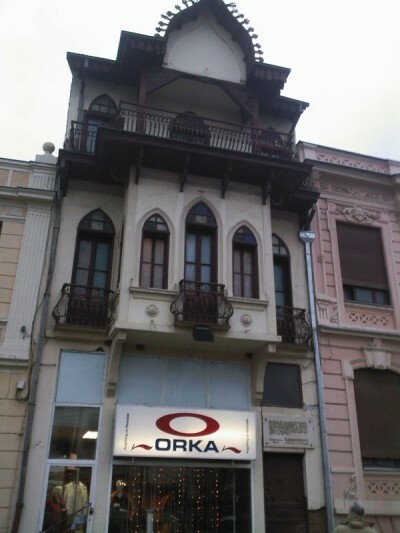 And finally, as a linguistics student and friend and admirer of Albanians and their culture, I had wanted to visit the city that hosted the First Albanian Alphabet Congress in 1908, with the participation of the Muslim Mithat Frashëri and the Catholics Luigj Gurakuqi, Ndre Mjeda and Gjergj Fishta, among others, and including Albanian Orthodox Christian representatives. I went to Manastiri in the company of the Kosovar Albanian linguist Gazmend Berlajolli and a representative of the University of Tetova and of the Bektashi community, Shpëtim Mahmudi, two of my best friends. But Manastiri today, in its Albanian and Sephardic aspects, is a city of ghosts. Although some Albanians, few Turks, and even fewer Sephardim still live there, they are far outnumbered by Slav Macedonians. To pass along the streets of Manastiri is to grieve for what might have been had the atrocities of Slav imperialism and the Nazi Holocaust not taken place. Manastiri's city center still boasts finely decorated buildings from the late 19th and early 20th century, built by Sephardic and other prominent citizens in the new architectural styles then visible in Western Europe, and its Jewish Cemetery is large and impressive. But Jews are seldom found in its streets. And although signs are occasional written in Macedonian and Turkish, and the Muslim call to prayer is heard from the great Isak Mosque in the town center, we found the mosque's doors closed and the sacred structure empty. Traces of the Albanian Alphabet Congress, one of the great achievements of Albanian intellectuals, are equally elusive. After inquiring with a Macedonian cabdriver, who introduced us to an Albanian friend of his, we were taken to the unassuming building on the quay of the river Dragor. There we read a plaque inscribed, "In this house between the 14th and 22nd of November 1908 the Manastiri Congress of Albanian patriots met to adopt the modern Albanian alphabet." The inscription dates from 1968, commemorating the sixtieth anniversary of the event, and it was genuinely exciting to think we stood where great Albanians like Frashëri and Fishta had once met to resolve their differences over the future of Albanian orthography. Unfortunately, by the time we located the site, the night was too dark to take reproducible pictures. Yet the Albanian language and the Albanian nation, even if reduced in their presence in Manastiri, have survived the onslaught of Slav hatred. No such outcome was decreed for the Sephardim of Macedonia when Nazi and Bulgarian wolves attacked them. I have written in my 2005 book Sarajevo Rose, which I hope to reissue in an Albanian-focused version under the title The Road to Ulqini, that while Albanians and Sephardim lived in close proximity in Manastiri and elsewhere, little history of interaction between them is recorded. That is because history is based on conflict, and there was never friction between the Albanians and the Sephardim, two creative but isolated peoples most often surrounded by enemies: "History is conflict; no conflict, no history." Still, I had inquired of Nissim Yosha about how the Manastirli Sephardim, as they are known, viewed their Albanian neighbors, and he "remembered stories heard in Jerusalem in childhood from [his] grandfather… that Jews from Manastiri very frequently visited Prishtina for commercial as well as social purposes." Manastiri and Prishtina are hardly close to one another, but the Sephardim were always peripatetic travelers in the Balkans. There are, however, aspects of Albanian and Sephardic history in Manastiri and elsewhere in the Albanian lands that until now have been little known, but deserve wide and extensive remembrance. The first and most significant is, of course, the role of the Albanians as "righteous gentiles" – many of them Muslim – who saved Jews from Nazi genocide in Macedonia and Kosova as well as in Albania itself. On January 29, 2008, the International Day of Commemoration in Memory of the Holocaust, the Mission of Albania to the United Nations joined the Missions of Hungary and Switzerland in an event at the UN hosted by Yad Vashem, the Holocaust Heroes' and Martyrs' Remembrance Authority in Jerusalem, to recognize Albanian and other rescuers of Jews during the second world war. It is long past the appropriate time to salute the selfless action of the Albanians who prevented the pagan Nazis from deporting a single member of the Hebrew nation from Albania itself, and who impeded those satanic efforts in Kosova and Macedonia. Yet the role of the Albanians remains controversial for some interests, typically located in Belgrade and Shkup. Until recently, it was asserted even by so fair and friendly a source as Noel Malcolm, writing in Kosovo: A Short History, that at least 200 Jews had been transported from Kosova to Bergen-Belsen during the Holocaust. Nevertheless, the recent discovery of the original German roster of 238 individuals deported from Prishtina in August 1944, as well as other documents, preserved by Shaban Sinani, former director of the Albanian National Archives, and Claire Lavoine, a disinterested Frenchwoman of high ethics, is of exceptional importance. These sources show that no more than 40 Jews or offspring of mixed marriages were included in the Nazi transports from Kosova, with the great majority of deportees from that territory made up of Albanian and Serbian partisans, Communists, other opponents of Nazism, and various "undesirables." While even the low number of 40 Jewish victims in Kosova is reprehensible, it demonstrates that the Albanian record for protection of Jews was, if not perfect, closer to it than many have claimed. Research on this and other cases in which Jews were rescued by Albanians form an important part of a new project underway in Bosnia-Hercegovina: the compilation of an authoritative list of "righteous gentiles" in ex-Yugoslavia and Albania. This worthy effort is being conducted, with scandalously little in the way of financial resources, by the Institute for Research on Crimes Against Humanity and International Law at the University of Sarajevo, under the direction of Prof. Muharem Kreso, a Muslim, with the assistance of Eli Tauber, a Sarajevo Jew. Certainly, the record of Albanians in assisting persecuted Jews during the Holocaust, at the risk of the Albanians' own lives, represents a positive example, unfortunately obscured in comparison with the wartime action of Denmark in sending its Jews to neutral Sweden. Prof. Yosha, who directs the Association of Jews from Macedonia in Israel, has, with Nir Baruch of the Israel-Bulgaria Chamber of Commerce, conducted a valiant campaign to correct the historical record on the Bulgarian treatment of Jews during the Holocaust. While the Bulgarian government has long preened for having protected most of the Jews within its borders from the Nazis, it coldly handed over to the Germans the ancient Hebrew communities of central and eastern Macedonia and Thrace, awarded to Bulgaria by Hitler. Nissim Yosha recently addressed a communication to Georgi Parvanov, the president of Bulgaria, as follows: "I assume that in March 2008 there will be commemorated in Bulgaria the 65th anniversary of… the survival of the 48,000 Jews of old Bulgaria. In the same year  there also occurred the tragic… annihilation of the 11,343 Jews of Thrace, Macedonia and Pirot that were deported by the then-Bulgarian authorities directly to the gas chambers of Treblinka. Both events were connected as they occurred in the then so-called 'United Bulgaria' [under] the same government. Knowing your positive moral attitude regarding the historical truth and justice we hope that you will find [an] adequate occasion to [recall] the true facts to the people of Bulgaria and [all] civilized nations, asking the pardon of the 11,343 men, women and children who perished in March-April 1943 in the damned extermination camp of Treblinka. Such a presidential statement will elevate the image and the moral level of Bulgaria [as] an important member of the civilized family of nations." Let it be said and said again that the Albanians have already established their place in that family, and that the time has come for recognition of their action to be proclaimed to the world. But I would conclude by reference to other Manastirli "ghosts" that unite the destinies of Albanians and Sephardic Jews. In researching the life of Rabbi Bension, whose work on Jewish mysticism and its relationship with Islam literally changed my life completely, I learned that he had served as a rabbi in Manastiri before the first world war. The city was under Serbian occupation, and Albanian and Turkish people from the region were subjected to murder, pillage, and other crimes for which the Serbian soldiery were notorious. Mark Cohen writes of that time with an attitude of sharp criticism, describing the Serbian invaders looting Jewish and other businesses, and stating that "random acts of violence on the part of Serbian soldiers added to the insecurity [of the Sephardim]." Cohen frankly admits that Belgrade sought to "Serbianize" Macedonia, after renaming it "Stara Srbija." Bulgarians were expelled, Muslims were killed and their villages burned, and Serbian colonists began immigrating to the region. The Jews of Belgrade, who were mainly Sephardim and were led by the distinguished Rabbi Ishaq Alkalay, attempted to absorb the Manastirli Jews into the Serbian Jewish community. The Sephardim of Belgrade had been assimilated into Serbian culture and abandoned their Judeo-Spanish language, while the Manastirlis still spoke Spanish. The Belgrade Sephardim had even Slavicized their names. The new administration further attempted to submit Jewish religious and secular education to control by the Serbian school system. Cohen frankly identifies this as a "'Serbia for the Serbs' agenda" and states that the attempt by the Belgrade rabbis and their royal Serbian patrons failed: the Manastirli Jews "did not embrace a Serbian identity." Instead, many came to America. And here again, we find the invisible relationship of Albanians and Sephardim in evidence. Both faced Serbian and German Nazi aggression; both sought to preserve their distinguished cultural traditions. Sadly, there were too few Sephardim to resist the onslaught of Serbian and German imperialism; fortunately, there were too many Albanians to be wiped out by either. And finally, Jews in the first decade of the 20th century had only lately, against the Russian tsar, revived a spirit of militant resistance, such as never perished among the Albanians – a nation of heroes! I pray that American and Israeli Jews, no less than Albanians, will heed these, the lessons of Manastiri, "city of ghosts," in the coming weeks and months, as the independence of Kosova is debated in global institutions that have in general proven friendly neither to the Jews nor to the Albanians. As different as they were in religion and customs, the two communities that once represented Manastiri to the world have too much in common to let them be divided by the intrigues of fascist brutes, today, as so many times before, headquartered in Belgrade and incited by Russia. Let the virtuous Jews stand up with the Albanians, as the righteous Albanians once stood up for them. And one day, perhaps, Manastiri's ghosts will return to life, and revive the city's glorious past. In the name of the dead; in memory of Mithat Frashëri, a Muslim, Gjergj Fishta, a Catholic, and Ariel Bension, a Jew.